My Grandpa Anderson would be 100 on Monday. To honor him and my grandma, my family is having a family reunion tomorrow. I can't be there. But I am so thankful for them! Here are some memories I have of them! 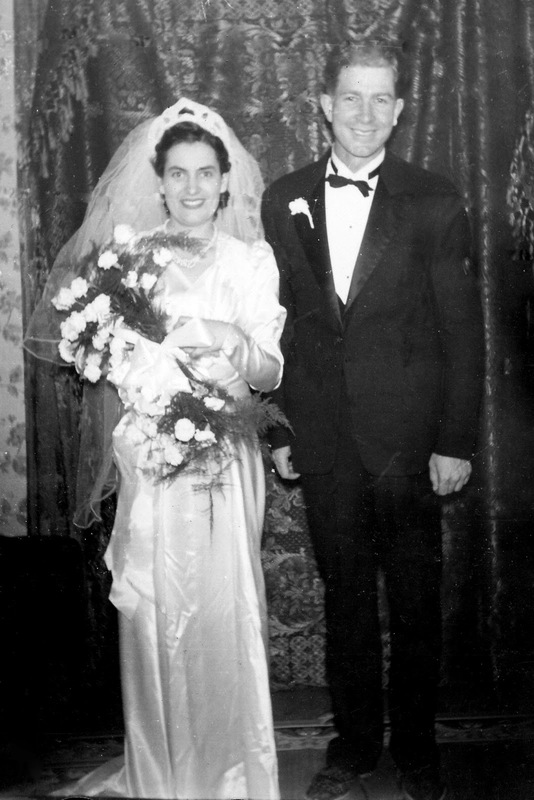 Joseph Arvin Anderson and Georgia Olsen Anderson; most people called them Arvin, and Georgia but I just called them Grandma and Grandpa. I feel very blessed that I got to grow up so close to my maternal grandparents. I wasn’t as blessed as my cousins that lived across the street or in the same town, but we were about two-and-a-half hours from my grandparents. I felt I was pretty blessed in comparison to some kids. Especially considering my paternal grandparents were a whole state away—I thought two-and-a-half hours was wonderful. The drive to Mesa was full of excitement and anticipation. I could hardly wait to see my grandparents and spend time with my extended family. With seven kids in our family, my parents never owned a vehicle that had enough seat-belts for all of us. As a parent now, I can only imagine my own parents as they loaded up the seven kids in the van. Someone was always on the floor or in a makeshift bed in the “cargo area.” I remember a lot of rounds of the “alphabet game” and countless verses of “99 bottles of ‘pop’ on the wall” in attempts to make the time pass faster. There were a lot of “he touched me”s, and even more “are we there yet”s. I remember a few times being stuck in traffic and someone having to go to the bathroom. If they announced it at a time where stopping was impossible, then it was always followed up with a sibling making water noises. Most of these games were followed my mom’s suggestion of playing “the quiet game.” I am sure she needed a few moments of peace! We loved the quiet game. We would earn a penny for every mile we could stay quiet. We were sure that we would become rich from such a game. Sometimes the trip got a little crazy but when we got to grandma and grandpa’s it was always worth the it. My memory can still smell the aroma that greeted us as we would get out of the van. In the winter time the smell of citrus blossoms, and growing fruit would swirl around us and lighten any travel worn mood that may still be lurking. In the summer it was the smell of Bermuda grass cooking in the heat of the blazing sun. If our shoes had ever been kicked off during the road trip, they were instantly put back on in order to walk up the burning front walk to the large wooden door. The door looked like sculpted chocolate as the wood carvings swirled in the dark heavy brown wood. All I knew is that there would be love and laughter (and maybe a little air conditioning) waiting on the other side. Their beautiful, simple white brick rambler home is still the house that most of my dreams take place in. The bedrooms were few and small but the living area was large and would allow for many guests. To me that home represented what my grandparents held very dear, their family. My grandparents had four daughters and one son. They loved all of their children, and counted their son and daughter-in-laws among them. This granddaughter never heard a negative word about any of them. As much as my Grandma loved her children, she also loved their spouses and her grandchildren just as much! My grandma was a school teacher and loving children came naturally to her, but of all the children she loved in the world, you knew that her grandchildren were priceless to her. One of my earliest memories of Grandpa was when he would give us “rosy cheeks.” Grandpa would scoop us up in his arms and rub his day old whiskers across our cheeks, giving them a nice rosy glow. I remember asking him to stop—all the while, giggling and loving the feeling of being in his arms. I can still faintly remember his deep crackly voice and his sweet chuckle. The memory of which reminds me of his light hearted spirit and his love for teasing. Everyone always remembers grandpa being the “snickers man”. I also remember grandma having frozen treats in her freezer and a frozen “snickers” ice cream bar was almost always found among them! I loved the treats they gave us, but more important than sweet food, I remember my grandparents always sharing sweet words. I remember one time Grandpa called our house and I happened to answer the phone. He didn’t instantly ask for my mom, he chatted with me for a little while. I remember feeling special, and important because he wanted to talk to me! I recall him asking me the normal questions, “how is school? What is going on in your life?” etc.… I loved talking with him. Yet there is one thing that he said to me that I will never forget, “Tiffany” Grandpa said to me, “you are a beautiful girl and someday the boys will be lined up around the block for you.” He probably said that to all of his granddaughters, for he has some beautiful girls, but I felt very special. With those kind words, my grandpa made me feel beautiful. That experience was just one illustration of the bond that I felt like I had with my grandpa. The other was the song he wrote for me when I was born. My parents had been blessed with four boys in four years. They were rowdy and rough and my mother had given up on the idea of ever having a little girl. To their surprise baby number five was a beautiful baby girl (me!) My grandpa wrote a song about how wonderful having a little girl is. I loved hearing the song. He sang it when I was baptized at the age of 8. My family also sung it to me on the day I got married. It made me feel so special that my grandpa wrote a song for me! When you grow up in a large family, something just for you is rare so that song has meant so much to me. When you talk about memories of my grandma the first word that comes to mind is teacher and the second is drama. When I say drama, I don’t mean the current definition of someone who is always creating a scene, and making mountains out of molehills. My grandma used drama to teach, to convey emotion through a message, and most of all to entertain. She wasn’t one who enjoyed conflict, she enjoyed laughter. My grandma could deliver a speech with conviction and a poem with passion. As children we loved to sit and listen as she recited, from memory, dozens of favorite verses that not only entertained but often had a little moral. The best teachers I know are ones that teach in such a way where learning isn’t a chore. My grandma loved people. She always had kind words to say about everyone. I can’t recall her ever spreading gossip or talking bad about anyone. I remember her open arms and an easy smile for all those she loved. Gladness would spread across her face whenever she saw a friend, or loved one. Grandma was a people person. There are sounds, sights and smells that always remind me of grandma’s house. One of them is the smell of bacon. Grandma always cooked great food. One night she was at our house because my parents were out of town. Grandma had cooked beef stroganoff for us to eat for dinner. At the time, it wasn’t my favorite meal and I made sure she knew about it. She made sure I knew that complaining about a meal that has been prepared for you is very rude and unacceptable. It was a lesson that I haven’t forgotten. The sound of a ceiling fan also always reminds me of grandma and grandpa’s house. I spent many nights sleeping in the family room at my grandma’s and they had a ceiling fan. The whirling of the ceiling fan often lulled me to sleep. Spending the night at grandma’s house was great! Grandpa often would make sourdough pancakes and of course there was usually bacon. I remember several occasions where sleeping bags were spread out across the floor and cousin after excited cousin sprawled out across the expanse of the living or family room. Some say our family is different because the cousins are so close. I know that it was nights like these that added to that closeness. I remember seeing pictures in my Grandparent’s home. There were paintings that adorned the walls, but I remember the pictures of loved ones. Grandma and Grandpa had a missionary table full of their grandchildren that served missions. I remember watching as the first pictures started filling the table. It started with the Simon cousins, which lived far away. Even though they lived across the country, we knew them. My grandma allowed them to be examples in our lives. Then my own brothers started filling up the table. I knew that I wanted to follow the example of my great-grandma, grandma, grandpa, father, brothers, cousins, uncles and countless ancestors and also serve a mission. I was very excited the day that I got to join the missionary table as the first female descendent to serve a full-time mission. Another picture that was influential in my life was the picture that grandma and grandpa displayed of their wedding day. It always reminded me that we were an eternal family. I knew that because my grandparents were sealed in the temple that we would always be together. It always gave me a reason to do my best, to be part of our large eternal family. The most recent memory I have of Grandma and Grandpa Anderson was November 29, 2008. They both had passed away by this time. That was the day that I was sealed for time and all eternity to my sweetheart, and my two little boys. There were so many of our friends and family there with us. As I looked around and saw the faces of those I loved, my spirit felt the presence of those whom could not be seen. My grandparent’s presence was so strong—I could tell you exactly where they were standing. Through this and other experiences—I know families are forever. I am so glad that I have such amazing grandparents. Their legacy will live on. I enjoy telling my children about my grandparents. They have left us with so much to aspire to. I pray I can do just that. What an amazing story!! Love the memories shared! Thank you Tiffany! That was beautiful! I loved reading about your grandparents. You are an amazing writer.